Since I started using, building, and selling residential reverse osmosis units in the early 1990s, there have been repeated efforts to get rid of the much maligned bladder tank that’s a standard feature. 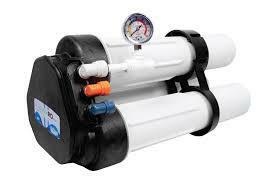 Small reverse osmosis units need a storage tank because they make water very slowly. Without a tank, a typical undersink RO unit would put out only a small trickle of water when the thirsty user opened the faucet. Most of us aren’t patient enough to wait several minutes to fill a water glass, much less a couple of hours to fill a spaghetti pot. The function of the bladder tank is to collect and store the trickle produced by the RO unit so that when you put your glass under the spigot the pressurized tank can supply enough water to fill your glass quickly. Or even your spaghetti pot. The standard RO tank has a small air charge that pushes water out of the tank when the countertop spigot is opened. As the tank fills, the pressure in the tank increases and the RO unit has to work harder and harder to pack water into the tank. As the tank fills and pressure increases, the RO unit’s efficiency decreases dramatically. Although this standard bladder tank works pretty well at storing and delivering water, it has a flaw. As the tank fills, pressure inside increases, causing the RO unit to have to push against the rising pressure to fill it. When the tank is near full, in fact, the RO unit is really huffing and puffing to push water into the tank and its efficiency is a fraction of what it would be if it were putting water into a pressure-free container. In practical terms this means that a small RO unit whose efficiency is set up to work at 3 or 4 parts to drain to 1 part to storage is actually running 10 or 12 parts to drain to 1 in the storage tank when the tank is almost full and the RO unit is pushing against 40 or so pounds of tank pressure. The “water on water” tank. The “water on water” strategy is to push the permeate (the water you’re going to drink) from the tank with tap water rather than air. The permeate is in a bladder inside the tank. When the spigot is opened, tap water rushes into the tank around the outside of the bladder, squeezes the bladder and pushes the permeate out of the faucet. This is only a semi-solution. Although the RO unit produces water without back pressure in the tank, saving water, water is wasted when it is used to push the permeate out of the faucet. All of the “push” water eventually goes to drain. The worst part is that water on water units seldom work as advertised. Those that I bought and tested failed to shut off reliably when the permeate tank was full. The most recent incarnation of the this style, a hybrid water on water, the highly promoted Next RO, was recently taken off the market because of repeated performance issues caused by its over-complicated water storage scheme. The electric pump tank. With this style, a small unpressurized tank receives the permeate water, allowing the RO unit to produce without back pressure interference. When the spigot is opened, a small electric pump comes on to push the RO water out of the faucet. This style mimics large “whole house” units, but it’s a case where something that works well full size doesn’t works so well when it’s miniaturized. Most attempts to create the electric pump tank style have fallen victim to complaints of leaks, excessive noise, chattering pumps, high cost, and failure of high tech components. It just isn’t feasible to make a pump-driven system that fits under the sink and gives the same silent, trouble-free performance over a period of years as the old-fashioned bladder tank. The jumbo RO unit. The most popular attempt to replace the bladder tank in recent times has been to simply make a massively over-sized RO unit–one that’s so big that it produces as much water as you need on demand, in real time, without having to rely on a storage tank. To put this in context, we build a small countertop RO unit that has a 50 gallon per day production. It is a bona fide tankless RO unit. It produces into a no-pressure container. This works well if you catch the water in a bottle for later use. It produces in theory (with RO, theory and reality are seldom the same) about 2 gallons of water per hour and will fill your 5 gallon bottle in 2.5 hours. If you depended on this unit, however, for real time use, you would have to patiently hold your 8-oz. cup under the dispensing tube for almost 4 minutes to fill it. But, if the unit produced 700 gallons per day rather than 50, you could fill your cup on only about 20 seconds. That’s about half speed compared to old reliable bladder tank performance, but you could live with it. The 700 gallon-per-day production was what was promised by the now defunct Merlin wonder unit that came out a few years ago. The Merlin was a multi-million dollar promotion by its originator, General Electric, and later by Pentair, that got stuck with it as the result of a merger. The Merlin was touted as the “most significant advance in home RO technology in 30 years,” but ended being finally pulled off the market in 2010 after years of frustrated customers and failed attempts to fix its many faults. The last heroic effort to save the tank-free Merlin was, you guessed it, the addition of a pressurized storage tank. To say that the Merlin was a flop is an understatement. What’s strange isn’t that it didn’t work but that that anyone with rudimentary knowledge of RO units thought it would work. I won’t dwell on its many design flaws, but I’ll mention one problem that automatically spells doom for any attempt to make a tankless undersink RO unit by simply making a big producer and sticking it under the sink. When a reverse osmosis unit comes on and begins to make water, the first water that comes out of it is the worst it will make. On startup, it spits out some pretty awful water. That’s why “whole house” units normally begin with a “flush” cycle that opens the drain and flushes the membrane for one to five minutes before the unit begins collecting water. Obviously, this isn’t practical with an undersink unit. So to use a large “water-saving” tankless unit, the logical thing would be to open the faucet and let it run for a minute or so before filling your glass. Or, to be content with drinking the worst water the unit can make every time you fill your glass. This tankless RO unit (for which an optional tank is available) advertises production of up to 1,000 gallons per day. A web search confirms that there are a couple of new jumbo-style tankless undersink units on the market. I haven’t looked at them seriously. One has a strange physical resemblance to the ill-fated Merlin. My advice is to never be first on this type product. If they’re still selling it in a couple of years and the reviews are good, then consider buying it. 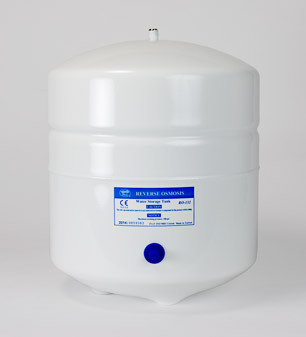 The best solution to the bladder tank problem at present is the permeate pump. This well established addition to conventional RO units does not get rid of the tank but it eliminates back pressure, the main problem caused by the tank, by allowing the membrane to produce into a pressure-free chamber. The permeate pump is not perfect, but it definitely saves water. The future for water saving with small RO units may be found more in improved membranes than getting rid of the bladder tank. A new Pentair membrane (we’re testing it now) is designed to run on a one to one brine to permeate ratio rather than the one to three or four of standard membranes. We’ll see.